Essential: Minimum MBBS with completed internship and registration with Medical Council of India. Candidates with Diploma in Medical Specialty and Post Graduate qualification (MD / MS) in Medicine / Surgery and Obst. & Gynecology may be considered. (i) PG Qualification in Medicine / Surgery and Obst. & Gynaecology will be an additional advantage. (ii) Diploma in Industrial Health / Certificate in Industrial Health or Associate Fellowship Industrial Health. 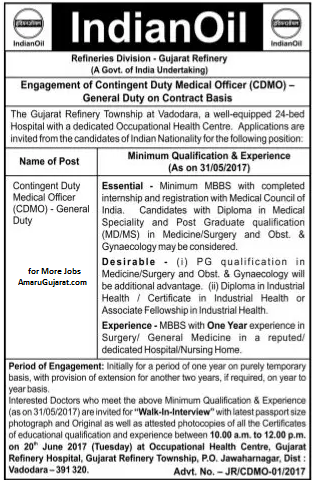 Experience: MBBS with One Year experience in Surgery / General Medicine in a reputed / Dedicated Hospital / Nursing Home. How to Apply: Interested doctors who meet the above Minimum Qualification & Experience (as on 31/05/2017) are invited for “Walk-in-Interview” with latest passport size photograph and Original as well as attested photocopies of all the Certificates of educational qualification and experience between 10:00 a.m. to 12:00 p.m. on 20th June 2017 (Tuesday) at Occupational Health Center, Gujarat Refinery Hospital, Gujarat Refinery Township, P.O. Jawaharnagar, Dist. Vadodara – 391320.